Framing was started in the middle of the vessel because these frames use the largest pcs. of wood. 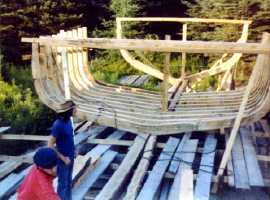 If you were to start at the ends of the vessel, you might use up large pieces that would be needed in the middle. A slot was made along the right side of the keel, through which the centerboard would pass.